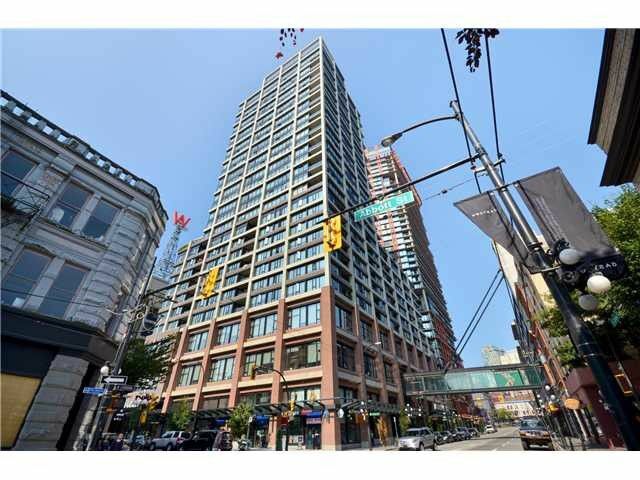 Woodwards - This stunning 628 SF 1 Bed + 1 Bath home located in historic Gastown. Features high end furnishing including custom Eggersman kitchen & bathroom cabinets, stone countertops, stainless steel appliances,gas range, oak H/W floors, seamless glass enclosed shower & lots of windows bringing in plenty of natural light. Also enjoying East facing views of the mountains, Burrard Inlet & city! Excellent amenities include: rooftop lounge, exercise room, hot tub & patio, garden and library. Maintenance fee includes heat & internet. 1 secured leased parking included. Investor rentals allowed.